When Buffy the Vampire Slayer went off the air several years back it had a nearly perfect ending. There was tragedy and our heroes won the day. But there were also questions: What happened next? What did Buffy do with all of the potential Slayers activated? There was a hint of an answer in Season 5 of Angel, but still there were questions. 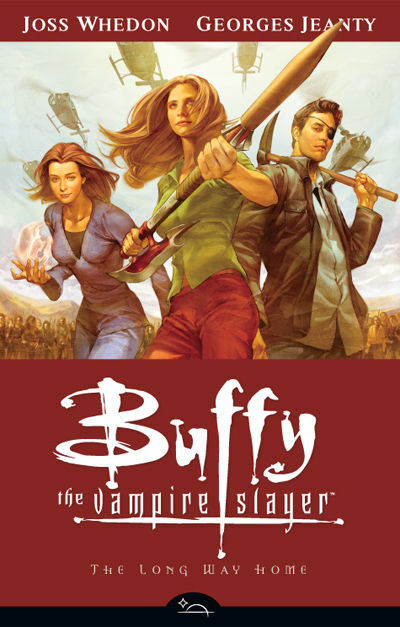 Joss Whedon did not come back to television to continue Buffy's story, he turned to comics and to Dark Horse to tell the story. Dark Horse is releasing Buffy the Vampire: Season Eight as if it were an actual season of television rather than a long running comic. With no interest in buying any individual issue of the new Buffy comic, I have to wait for the trade paper editions which collect a handful of issues in one book. The Long Way Home is the first of the Season Eight books and will be released in November. I'm not a big comic reader, but this is one I am very much interested in. Joss himself is one of the writers so I know it is telling his story. Let me know the next time you'll be down visiting Jerry & Sara. I have all the season 8 issues that I would be happy to loan you. Thank you! I appreciate that. I'll keep you posted.